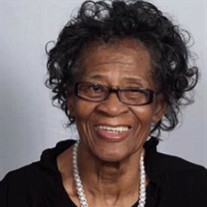 Obituary for Essie M. Ivy | E.F. Boyd & Son, Inc. Went home to be with the Lord on May 13, 2018. Beloved mother of Mary (deceased) and Patricia; sister of eighteen; grandmother of two; great grandmother of four. Family will receive friends 10:00am at St. Luke Overcoming Church 7919 Kinsman Ave. followed by Service at 11:00am. Arrangements by E.F. Boyd & Son Funeral Home 2165 East 89th Street.